I feel very grateful indeed to share that I have been privileged to receive a fellowship for next fall at the Henry Luce Center for the Arts at the Wesley Theological Seminary in Washington, D.C. I'm so delighted with the prospect of having this wonderful opportunity to work there. What I would like to engage the student community with there is a dialog in art process about interconnectivity and interdependance, within the continuing metaphor of "Spider Woman's Hands". What I show here are some very rudamentary sketches of how such a piece might evolve into an altar/exhibit. 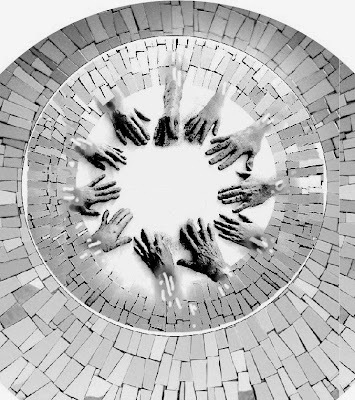 I want very much to do a large circle of participant hands, embedded in an ornate circular frame that consists of individual tiles, representing symbolic qualities of each individual who has contributed to forming the whole. Above is a recent sculptural sketch I made, using cast hands of Lori, a midwife in Pittsburgh I met. 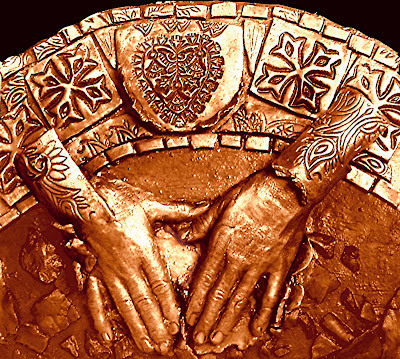 I decided to call this piece "Ancestral Hands - the Midwife", recognizing the nameless midwives who have brought each new generation forward into the world, their hands and stories buried in the earth, emerging here with all the power of the gesture Lori made, the gesture of opening a portal into life for those whose time has come to be born. yes, i was (and still am) rainbow woman. 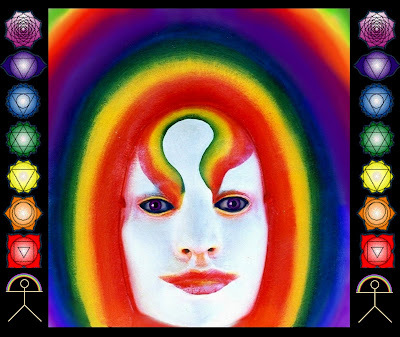 In the preceeding post, I concluded with choosing "The Rainbow Woman" as the excerpt from my new book that I felt like posting. As I sat typing that post, I simultaneously was checking my emails.....and in came a group email about an event being organized in the Bay Area. That was a no delay syncronicity indeed, because I recognized the address as belonging to a woman from the 2006 Spiral Dance - none other than the very last dancer to wear the "Rainbow Woman" mask! I wrote to her and above is her response. We are all, truly, linked. This has been a week of syncronicities! "To me, the Rainbow is actually a circle. but at the foundation never the less." Perhaps Syncronicities are like that, the other end of the rainbow, the invisible threads made visible, here and there. Hidden, "but at the foundation, never the less." 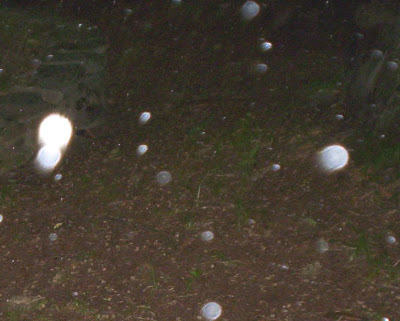 I received an email from a woman I met at Lilydale, who was sponsoring the showing of a recent movie "Orbs: The Veil is Lifting" about this phenomenon which has been recorded through the medium of digital cameras by many. I received the same day a series of photos from Lena Grace, who purchased several of the Masks of the Goddess this past year, including the Kali mask. 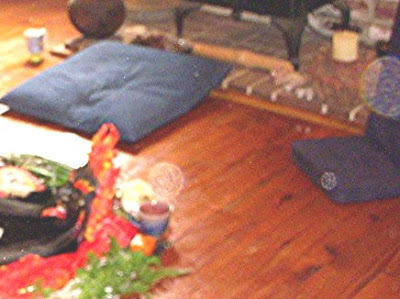 They are photos of her group of women making altars, and the Kali mask is included in one of the altars. The email makes a comment that these are more "wonderful photos, orbs and all." I disregarded both emails, but did go to Lilydale yesterday, just to "say goodbye" to a place I so much enjoy. At dark I stopped to get some gas, and noticed that the building Jan (my aquaintance in Lilydale) holds her meetings in, which is across the street from the gas station, had a lot of lights on and cars out front. So, of course, I had to go check it out.......just in time to walk into the movie as it began! I now know considerably more about orbs, and what various people think about them. Among the interviewed people in the movie I was surprised to see Sergio Lub, a man I used to know many years ago when I was on the crafts circuit. His name popped up again this past year, because my friend Tom Greco (who is currently travelling throughout Malaysia and inspiring me to do the same with his travelogue and photos) lived and worked with Sergio this past year in the Bay Area. "Funny", I thought, "I never imagined Sergio would be interested in something like orbs." Oh, and by the way. Tom had just sent me his recent post about his travels in Penang, and a whole bunch of new photos! Sometimes, I just love the internet. In a quantum universe, I also have to wonder if syncronicities follow me about just because I happen to be so fascinated by them, and have a blog called "Threads of Spider Woman"! 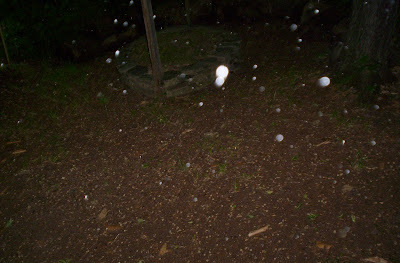 PS: If this isn't enough, below is the final installment (for the moment, anyway) on "orbs". While I was sitting over coffee telling this story to my fellow campers, Nancy ran back to her tent, and came back with her digital camera, and some night time photos she took of the "Nemeton", a sacred place at Brushwood. The photos were full of Orbs. You can actually "flip" the pages there. It is not actually finished yet, as I await some new entries by collaborators, especially, Macha Nightmare, who created two spectacular events with the collection and is really responsible for inspiring me to do it in the first place - but there it is and the book looks fantastic, if I don't say so myself. I hope, when Macha and some other collaborators get their articles in, I can also bring the price down by reducing the size of the book (not the number of pages). But as it is, it's for sale for $100.00, a limited edition art book, coffee table size. I wanted to excerpt from the book, and since it's my birthday today and I'm in a great mood, with the great and vast clouds of the the great lakes rolling across my horizon line as I write making rainbow bridges across the heavens, I think I'll excerpt "Rainbow Woman". And may this book, as Macha Nightmare wrote for her "Rainbow Of Goddesses" perfomance in 2000, "Generate waves and waves of pleasure, inspiration, and healing throughout all the worlds. So May It Be!" into an underworld realm. It continues beneath the Earth, hidden, but at the foundation never the less." before the invasion of Iraq) I decided to make this new mask to add to the cast. My Rainbow Woman is not about historical or indigenous "Goddesses of the Rainbow"; rather, she is a hopeful Goddess of the evolving human “Rainbow Tribe". 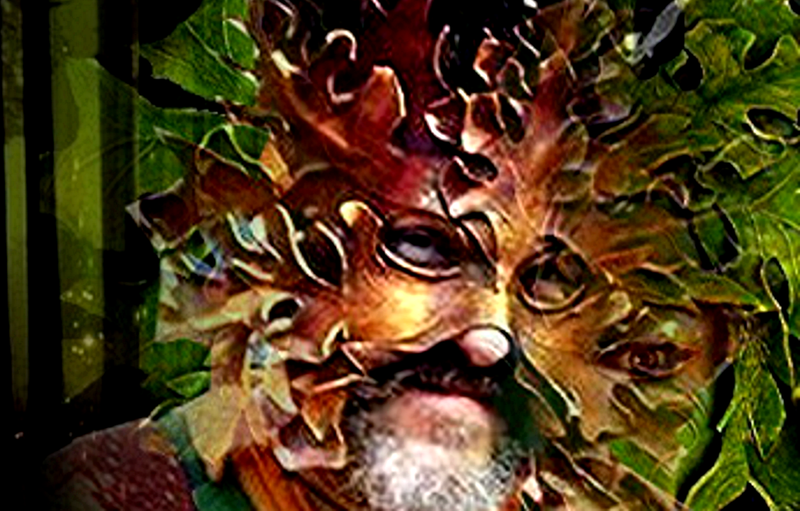 And the stories and mythologies about the new Rainbow Woman haven’t really been told yet, the birth of a multicultural world that celebrates her “rainbow” of global and ecological diversity…… hasn’t yet come to full term. There is a Cree prophecy, from the past century, that a time would come when greed and ignorance would ravage the Earth. Forests would be destroyed, birds would fall from the air, the great waters would be fouled. A similar prophecy is found among the Hopi and the Lakota about a time when the "Warriors of the Rainbow", people from all the races and nations of the world, would come together at last to restore unniversal harmony with the Earth, and with the Great Spirit. The rainbow is a perfect symbol of wholeness, because it contains all the color frequencies in the visible spectrum. 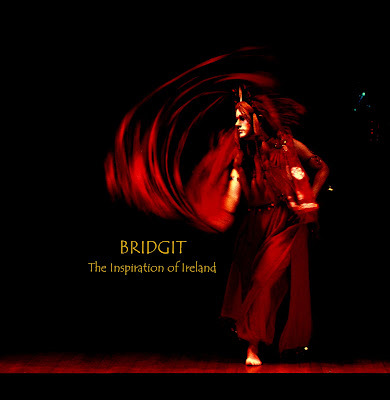 The Rainbow is also, in many folk tales (including those of the Norse) the Bridge between this world and the divine realms, between heaven and earth, between other dimensions of being and ours. I liked that ~ because building bridges of peace and understanding is what the future must bring if we're going to survive. I was delighted to see this mask worn by women to offer their blessings ~ blessings meant, especially, for those who are yet to come.